This game was very little about winning or losing and more about giving the roster bubble guys one last shot to showcase the potential. The coaching staff kept pretty much every starter on the bench for this one. Kyle Lauletta got the start and showed that he has a ways to go when it comes to developing his NFL passing ability. He was comfortable on simple read throws underneath, but struggled to get the ball downfield accurately. It led to 2 interceptions. NYG forced three turnovers themselves, hopefully a sign of things to come, but they also allowed an 86 yard touchdown late that put the game out of reach after a back-and-forth defensive battle. NYG lost the game 17-12 and paved the way for the roster cut down. Major injuries were avoided for the 4th week in a row. Bring on Week 1. Kyle Lauletta: 8/19 – 118 yards – 1 TD/2 INT. With both Eli Manning and Davis Webb on the sideline for this one, we got our first extended look at the 4th round rookie. Two things I have liked about his game showed up again in this one, his release and footwork. He is further along than some of the QBs that were taken ahead of him in this 2018 class. He made a few aggressive throws downfield and failed to connect on all of them. He just under threw most of them and the lack of arm power that was discussed in his scouting report definitely showed up. His targets had a step or two in their defenders but the ball just didn’t get there. Both of his interceptions were poor downfield passes. Overall, it was a rough night for the rookie and now it will be back to holding the clipboard while trying to learn the game as much as one can from the sidelines. Alex Tanney: 13/23 – 92 yards – 1 TD/0 INT. Tanney took over toward the beginning of the 3rd quarter. He never really had a shot at making this roster barring injury, but they still gave him a decent amount of playing time as Lauletta struggled and also started to get banged around by the Patriots pass rush. His final drive resulted in the second NYG touchdown of the night thanks to three NE penalties (one of which nullified a pick 6). -This was one of the roster competitions to keep an eye on. If NYG ends up keeping a fourth RB on the team, it will come down to one of Jalen Simmons, Robert Martin, and Jhurell Pressley. Simmons seems to have the inside track, as he saw the most playing time and carries. His footwork and vision seem to be a notch or two higher than the others. He works his way through traffic with a low pad level and showed enough burst. Pressley and Martin have had their moments here, but now that Simmons is healthy again, I think he won the role if they do keep a fourth RB. -Just like the RB position, it seems there may be one more WR spot up for grabs. Kalif Raymond was featured a few times, finishing with a team high 7 targets but only brought in 1 reception. He was the victim of a couple bad deep balls from Lauletta despite impressive releases off the line. Amba Etta-Tawo had the play of the night with a 41 yard touchdown that was 37 yards after the catch. His impressive burst and long stride speed jumped off the screen in a game full of backups. His hot start to training camp simmered down but he finished with a bang. He did drop a ball later in the game, however. -Travis Rudolph, a popular player at this time last year, caught all 3 targets that were thrown his way. I am surprised he hasn’t been given more looks with this regime. He, along with Roger Lewis (who had another quiet night), seem to be heading elsewhere this season. Alonzo Russell is an interesting guy. He flashed a couple times in games and at 6’4/210, that kind of size might be something to work with on the practice squad. -No Evan Engram or Rhett Ellison in this one. Jerell Adams, Garrett Dickerson, and Scott Simonson saw the majority of the snaps. As much as Adams has been up and down this preseason, I think he gets the nod for the number three role. He added a couple more catches and actually had a very solid night blocking the edge. Simonson brings similar presence to the trenches but he just doesn’t have the catch radius that Adams does. -Sticking with the theme of the night, it was a night full of backups. John Greco and Chad Wheeler both allowed sacks but it appears both are going to be primary backups for at least the start of 2018. What I don’t like about Wheeler is the lack of progress he has made with technique. There was a play where he was pass blocking while facing the quarterback trying to box the defender out. He gets turned around and caught off balance way too often. Greco offers the versatility inside you want on game day. He can play OC and both OG spots. His strong preseason play combined with his strong finish in 2017 provides security. -John Jerry may be an expensive backup and he too has some awful looking technique at times, but he can still get plenty of movement in the run game as a straight ahead blocker. He had some nice pops at he point of attack. Perhaps the most impressive young lineman on this team is Chris Scott. He, too, provides versatile depth inside and he graded out in a positive manner for the fourth week in a row, the only linemen on the team to do so. -This was a night for Lorenzo Carter to show what he’s got, and he shined. The rookie recorded 2 pressures and a sack in just 18 snaps played. With the status of Olivier Vernon up in the air, Carter’s role is going to be an important one whether he is ready or not. He showed excellent hand usage, easy leverage, and the well-known speed in space. Avery Moss finished with 5 tackles but failed to make a difference in the pass game. He has continued to struggle to show any sort of physical progression in year two. -The most crowded/deep position group on this roster. Robert Thomas appears to be entrenched as the primary backup at NT. He recorded a sack and 3 tackles. Thomas is going to benefit greatly from this scheme because it allows him to do what he does best, attack up field. He carries a lot of power when he moves north and consistently creates a new line of scrimmage. -A.J. Francis led the group in snaps but was inconsistent. The one glaring hole in his game and this dates back to college, is the pad level. He gets too upright and will get easily moved. Izaah Lunsford had a pressure and flashed some nice athletic ability, but he is a sloppy player. -One of the more interesting position battles on this roster may have very well came down to this game. Calvin Munson was a feel good story at this time last year, but he really hasn’t burst into the top 3 or 4 inside linebacker rotation. He doesn’t have the speed or coverage ability for this scheme and his presence between the tackles seems to get lost. Tae Davis, while undersized, has been displaying the opposite. He finished with 6 tackles and factors more on special teams with his speed. He plays bigger than his size but he has had at least 1 missed tackle in each game, including this one. -Ray-Ray Armstrong has developed more and more with each week. He has picked up this scheme as well as anyone on the team and matched with his skill set, he is going to be a factor. The former safety covered well up the seam and also laid the wood on a QB hit early, probably the hardest hit of the night. -A lot of competition in this group. I wouldn’t say it is a strong group of corners. They are competing for the spots on the bottom of the depth chart. With that said, Donte Deayon had his breakout performance with 2 interceptions and 2 pass breakups. His size is always going to limit him in certain situations, but he has the knack for the ball that you want to see in a CB. Great reaction time and the anticipation is improving. -Chris Lewis-Harris had a solid night with 2 pass break ups. He did a nice job of keeping himself in the right position. I think he has shown enough to make the roster but he may get caught on the wrong side of the numbers game. I like his ability to cover moreso than William Gay, but Gay’s experience and versatility may get him the nod. Leonard Johnson is still a guy I would like to keep around as well. He had a couple of physical tackles and he plays with the short memory and aggression I want. -Andrew Adams, starter of 17 games over the past 2 seasons, got plenty of time to show his worth. He had a couple of nice tackles, one of which was for a loss, where he showed the needed range and physicality. But similar to what we have seen out of him in the past, he missed 2 tackles and was way too late on deep coverage responsibilities. He just doesn’t show the instincts you need back there. Michael Thomas, a guy this staff may want to keep around for locker room reasons, finished with 5 tackles and played like a hard-nosed linebacker at times. He plays big and may be the ideal backup to Landon Collins. -Sean Chandler got playing time late and showed quality movement in coverage, but he is too much of a non factor against the run. K Marshall Koehn: 0/0 and 0/1 XP. Koehn missed his lone extra point attempt. He really has no shot at making this roster anyway. P Riley Dixon: 6 Punts – 45.2 avg / 43.5 net. Very good net average there. 4 of his 6 punts were pinned inside the 20. -The Patriots know what they are doing when it comes to scouting and developing QBs. That’s why I am still scratching my head with their selection of Danny Etling. He is a plus athlete with a strong arm, but he is very erratic from a release and overall accuracy standpoint. I can’t imagine he is their long term plan at QB for the post-Brady era. -Another spot NE has done overly well with when it comes to the draft is linebacker. I’m sure some of it is scheme based, but I would keep a close eye on whoever they cut there. They have a surplus of young talent that produce on multiple fronts. -The Achilles’ heal of this team is going to be the OL. I don’t think they were upset about losing Nate Solder for the contract he got, but this group is very thin on the edges. Brady can overcome it to an extent, but their floor at the position has been getting lower and lower each year. -The biggest victory for NYG this preseason is the fact they enter the year with no major injuries. No, Darian Thompson’s hamstring injury is not major and I’m not sold he will make the team anyway. -If Donte Deayon proves to be a capable playmaker as the #3 or #4 corner on this team, he could prove to be the unsung hero of this defense. NYG has had issues creating turnovers over the years and we know this scheme can force QBs into throwing balls that they don’t want to. That is where the playmakers need to rise up and make things happen. -As we enter the one week away window, the three biggest concerns on this team are: lack of balance and stability on the OL, minimal pass rush without over-blitzing, and no playmaker at free safety. As the New York Giants wrap up the 2018 preseason, what have we learned? On paper – and based on limited on-field performance through three preseason contests – it appears the Giants will be a more competitive and better coached team. But given the abysmal, non-competitive 3-13 season the Giants are coming off of, that’s not saying much. How much better is the real question. Defensively, because of their line, the Giants should be very stout against the run. But pass defense could be a problem as the team’s sole pass rusher with any kind of a resume is the oft-injured Olivier Vernon. Even more concerning is the corner position outside of Janoris Jenkins, the free safety position, and ability of the linebackers to cover backs and tight ends. Offensively, the Giants have a set of skill position players that few – if any – teams in the NFL can employ. But questions remain about the team’s 37-year old quarterback and offensive line. Manning can still throw the football when he feels safe, but he’s got to prove he can still win football games after being hit in the mouth. The left tackle position has been upgraded, but how much of a problem will the center, right guard, and right tackle spots be? Will Saquon Barkley be dancing to find holes or will the line be able to consistently help him out? How much help will the Giants need to Ereck Flowers in pass protection? On special teams, the Giants are going to roll the dice with Aldrick Rosas again. The return game could give us heartburn as the chief candidates have ball security issues. Overall, this team has the feel of one that will regularly emphasized on highlight shows. We’ll see Odell Beckham, Saquon Barkley, Evan Engram, and Sterling Shepard make big, flashy plays. But will the team make enough of the less glamorous, consistent ones to win games? The defense will probably live and die by the blitz. We could see a lot of flashy big plays, but also long scores going in the other direction. The special teams still don’t seem special. Taken together, that’s a recipe for an 8-8-type season. In a watered-down NFL filled with teams with poor fundamentals that can’t practice and spoiled millennials, that could be enough to sneak into the playoffs, especially if the Giants can steal a game or two. Much will also depend on how good or ordinary the coaching will be. As for this game, I would not expect the starters to play much, if at all. Throughout the league, this final game has basically become a contest between back-ups, with coaches looking to avoid injuries to front-line starters while also making final evaluations on the lower third of the roster. As I mentioned last week, I was surprised by the way Pat Shurmur handled Eli Manning this offseason. This is the third time in his career that Manning had to adjust to a new offensive system, but Shurmur handled Manning like he’s been in it for years. For better or worse, it’s clear Shurmur trusts Manning, who was basically only given half a preseason game (Jets) and two drives (Browns) to get ready for 2018. On top of all of that, arguably New York’s two best players – Odell Beckham and Saquon Barkley – didn’t play or barely played this preseason, albeit for different reasons. In a nutshell, the band hasn’t played together yet. That is a little unnerving, but it is also building anticipation for what this offense might be. The offensive line hasn’t improved as much as hoped (yet?). The first-team unit has not been able to run the football with issues in the middle and right side of the line. This sounds hauntingly familiar. I think most fans correctly understand that the offensive line is the critical element in how good this offense can be. If Eli feels protected, he can still play. If the Giants don’t have to simply rely on the big play to score and maintain possession of the ball to keep drives alive, that gives more touches to Barkley, Beckham, Engram, and Shepard. More touches = more points. But the team has to be able to pick up first downs. Quarterback: For better or worse, Davis Webb will be the #2 guy and Kyle Lauletta #3. 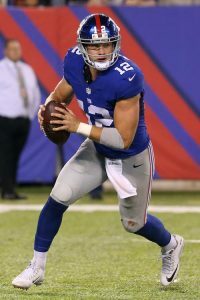 Webb may be the future, but if Eli goes down, the season is over in 2018. (No different than most teams). Running Back: Wayne Gallman has clearly out-played Jonathan Stewart and should be the #2 back. If he isn’t, that’s a bad sign about the coaching staff. Some fans don’t think Stewart should be on this team, but it sounds like the coaching staff still wants him here. That leaves Jalen Simmons, Robert Martin, and Jhurell Pressley probably fighting for one roster spot. This game will probably decide it. Wide Receiver: Odell Beckham, Sterling Shepard, and Cody Latimer will be the top three. I may be wrong, but I think all signs point to the Giants keep both Hunter Sharp and Kalif Raymond, as well as Russell Sheppard. Of course, someone coming free on the waiver wire could change that. Don’t be shocked if the Giants pick someone up here, especially if he has return ability. Tight Ends: Obviously, Evan Engram and Rhett Ellison are the top two guys. And with Shurmur likely to run a plethora of 2-tight end sets, both are de facto starters. That would suggest the Giants might even keep four tight ends. However, Shumur could decide to carry three plus a fullback. This is a big game for Jerell Adams, Scott Simonson, and Shane Smith. Again, they are not just competing against themselves but the waiver wire. Offensive Line: Trading away Brett Jones clarifies things a little. John Greco is now the primary center/guard swingman. John Jerry probably makes it unless a cheaper vet shakes loose somewhere else. Chad Wheeler has not progressed as hoped and is battling Nick Becton and the waiver wire for swing tackle. (Giants should seriously scan the waiver wire here). When you are keeping your fingers crossed that Eli Apple doesn’t get hurt, you know you are scary thin at cornerback. If Janoris Jenkins were go down, this unit would immediately become the worst in the NFL. It’s also concerning that Olivier Vernon is hurt yet again. The range and cover ability of the linebackers and safeties remain issues until proven otherwise. The good news? The Giants are big and strong up front. That’s the first place you want to start when building a defense. Defensive Line: This unit is pretty much set. The starters are damn good and there is good depth with Josh Mauro, Robert Thomas, Kerry Wynn, and A.J. Francis. Mauro will start the year on a 4-game suspension. Unfortunately, 2018 will be a red shirt year for R.J. McIntosh. The real wild card here is Wynn. Another preseason tease or will 2018 be a breakout year for him as a situational player? Giants will have to make a decision after Mauro is eligible to come back. Outside Linebacker: Broken record time…Olivier Vernon looks primed for big season but gets hurt early. This had better not be another one of those “nagging” injury issues with him that contributes to just another 6-7 sack season. The Giants need a 12-14 sack season out him. Kareem Martin will start opposite of him. He probably was a little nervous when the Giants signed Connor Barwin, but Barwin has missed almost all of the preseason with a knee injury. Lorenzo Carter is still learning the game, but flashes at times. It’s doubtful the Giants can keep both Romeo Okwara (who received 1st team reps this week at practice) and Avery Moss, unless the Giants cut Barwin. Huge game for both against the Patriots. Inside Linebacker: Alec Ogletree and B.J. Goodson are the starters, but Ray-Ray Armstrong is making a hard push for playing time. As I’ve stated before, Mark Herzlich has always been better suited for a 3-4 defense. Beat writers keep talking about Tae Davis. This is a big game for him. Cornerback: Outside of Janoris Jenkins, this position is a mess. Eli Apple will start because there are no better options. Donte Deayon is a walking injury. The others are castoffs who other teams will abuse all day long. Help wanted sign is out here. Safety: Landon Collins is probably overrated by some fans and underrated by others. He would be even better if he were teamed with a true, athletic free safety. That kind of guy isn’t on this team and won’t be in 2018. So James Bettcher will have to play mad scientist and mix-and-match at the position all year long. As of now, Curtis Riley has won the job by default because Darian Thompson can’t stay out of the infirmary. You have to wonder if the Giants will simply cut bait with him at this point. Michael Thomas and William Gay are plugins who you don’t want starting. Watch waiver wire here too. Aldrick Rosas has had a very good preseason. It makes complete sense for the Giants to roll the dice with him again. But you know everyone will be holding their breath with him when the games count. If Hunter Sharp and Kalif Raymond didn’t put the ball on the ground so much, the return game would be in decent shape. But they do. Bill Parcells wouldn’t even have them out there. This game is going to be big for guys like Jalen Simmons, Robert Martin, Jhurell Pressley, Jerell Adams, Scott Simonson, Chad Wheeler, Nick Becton, Romeo Okwara, and Avery Moss. In reality, watching the cuts on Saturday will be more interesting. 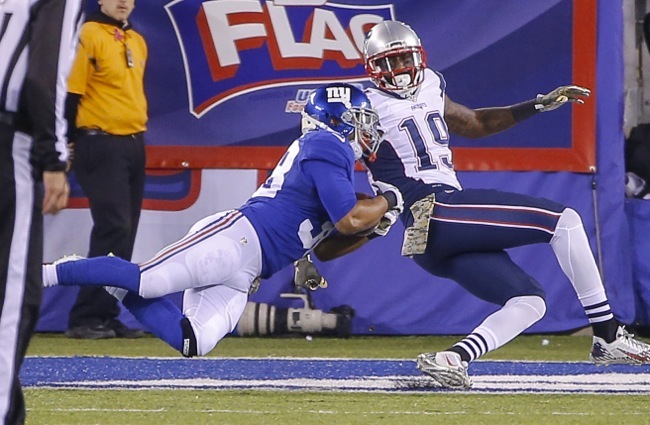 For the 13th consecutive season, the New York Giants ended their preseason schedule against the New England Patriots. These two have had a couple of epic Super Bowl contests over the past decade and even though multiple starters on both sides did not dress, there is an extra sense of nostalgia seeing the Giants in their “Whites” and the Patriots in their “Blues”. The final preseason contest was less about the starters getting their reps and more about the potential backups battling it out for roster spots. The Giants jumped out to a commanding 34-14 lead at halftime, clicking on all cylinders offensively. But just like last week against the Jets, the backup defense struggled to hold the lead and ended up losing it completely in the 4th quarter with under a minute left. 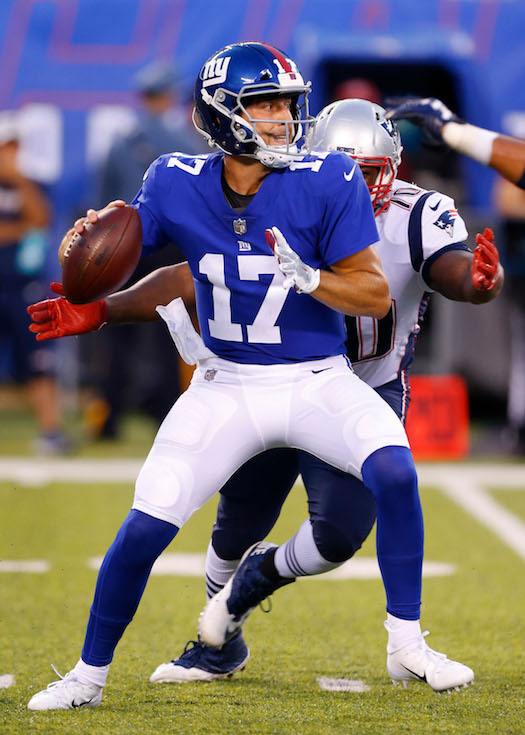 Rookie Davis Webb then engineered a 7-play drive which ended with a game-winning 48-yard field goal by fellow rookie Aldrick Rosas with no time left on the clock. 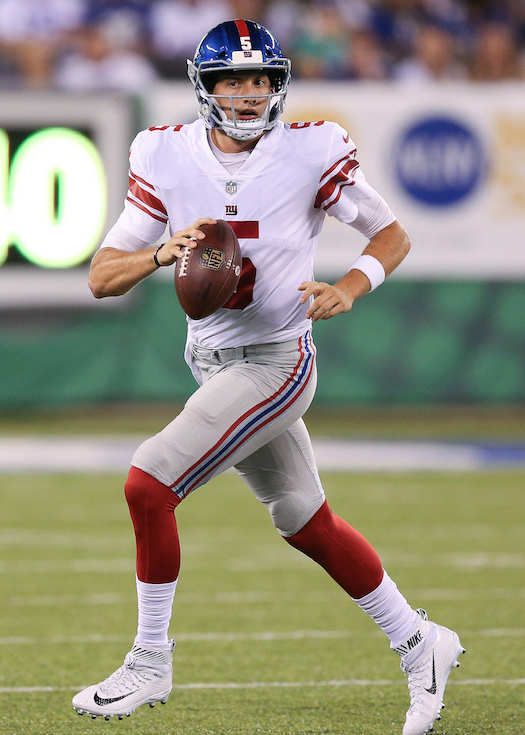 The Giants improved to 2-2 on the preseason with a 40-38 victory. The backup job battle between Geno Smith and Josh Johnson was back and forth throughout the entire preseason. Smith, the more talented of the two, was on fire going 10/11 for 111 yards and a TD. He was hitting guys left and right in stride with a nice blend of zip and touch. Johnson entered the game early in the 2nd quarter, getting the majority of the snaps. He responded with his own preseason-best performance, going 11/14 for 135 yards and a TD. At their best, Smith is the better quarterback. There is no debating that but Johnson may be the more secure guy. Who wins this job will come down to which situation they prefer, really. If I had to choose, Smith is the guy. Davis Webb came in during the 4th quarter. He went 8/14 for 103 yards and was a little erratic on his deep throws but continues to show excellent footwork. Webb works on his craft a lot, rollout positioning especially. It came to fruition in the game-winning drive when he evaded pressure from his blind side, rolled out to the left, and completed a nice ball. Hopefully this is the last Webb sees the field against another team until next year. All in all, he had a great preseason process. Shaun Draughn finally got to show this coaching staff what he can do. It’s been a bumpy ride when it comes to his health and opportunities, but a 14-carry, 54-yard night, including a touchdown and a couple catches, could be enough for him to warrant a roster spot. Orleans Darwka ran hard downhill, showing his physical brand and proving he is the top “pile-pusher” among the NYG backs. He has proven before that when he gets some space allowing him to gain a full head of steam, he can do damage in there. He carried the ball 8 times for 40 yards, including the long of the night, 21 yards. Shane Vereen and Wayne Gallman rounded out the rest of the RB play. Vereen looked physical, especially as a blocker. He is going to be a crucial part to this 3rd down offense. Gallman struggled to break free from initial contact. He probably takes more hits than he should considering his small-ish frame, but can’t blame a back for being a fighter. He enters the season as the team’s most explosive rusher. Shane Smith had his best game of the preseason and it looks like he is getting more used to the speed of the game. He is more assertive and showed a couple of nice adjustments to stick to his man and maintain running lanes. No Beckham, Marshall, Harris, or King. Opportunity for the young guys who want to make this team or practice squad. Travis Rudolph led the position group with 3 catches for 46 yards, including a gutsy extension catch over the middle on a seam route. From day one, he has been the young kid who does everything right from running routes, securing and tucking the ball, and constantly catching the ball. The physical shortcomings aren’t going anywhere, but he has proven he can make plays when the opportunity is given. Jerome Lane continued to impress. The raw, physical receiver showed another pure hands catch on a crossing route. For a guy that spent just one year in college as a wide receiver, the amount of untapped upside warrants a spot on the practice squad. Canaan Severin, Marquis Bundy, and Ed Eagen all had impressive nights in their own respects. Severin appears to be the highest-upsided of them all and could sneak his way onto a roster spot. His ability to adjust to the ball and attack with his hands at 6’2/205 is attractive. With Rhett Ellison and Evan Engram on the sideline to preserve safety, there were plenty of snaps to go around for Matt LaCosse, Will Tye, and Jerrell Adams. LaCosse, who had as good of a training camp as anyone when it came to making plays, finally got a steady dose of action and ended up with 5 catches for 60 yards and 2 touchdowns. As a blocker, he graded out above average. I think its time this gets on the 53-man roster because he hasn’t stopped making plays since he’s been here. Will Tye opened the game with a fumble on the Giants’ first drive. He continued to look more athletic than he was last season, but there is a sense of “You know what you are getting with him” when it comes to Tye. Limited upside both as a blocker and receiver. Adams has turned into a dominant-level blocker. His ability to stifle, move, and stick to defenders is going to a factor this year. He is still growing into his top-tier frame and it wouldn’t surprise me to see him on the field for 10+ snaps per game. All in all, a very solid performance from the backups. All 5 starters did not play, leaving it up to the back-up players themselves to give one last effort to make this team. The Patriots were very vanilla with their pass rush scheme, so that helped quite a bit. The young tackles, Chad Wheeler and Adam Bisnowaty, continued to show what we have seen all preseason. Wheeler is a gifted athlete with body control and balance, but there are flashes each week that show his lack of true man-strength and lack of experience. Bisnowaty was a major disappointment in his first preseason; there is a lot of work for him to do. No player has ruined more plays by himself than the rookie from Pittsburgh. He did get some action at left guard in the 4th quarter and for what its worth, looked more comfortable there when he wasn’t forced into space. D.J. Fluker excels against defenses like this, vanilla and straight-ahead power rushers. He can handle anyone that is thrown at him in that fashion. There are still a couple of occasions where he ducks his head and reaches when trying to block laterally. Brett Jones had a very solid game, especially in the run game. The team had a lot of success running off either one of his shoulders, I think the backup OC job is his. Jarron Jones, a practice squat candidate, has come along OK with his footwork in comparison to where he was in August. There is no way he can be depended on if an injury were to occur, however. He continued to whiff on defenders and appear three steps behind mentally. Damon Harrison, Dalvin Tomlinson, Jason Pierre-Paul, and Olivier Vernon didn’t dress for the game while Jay Bromley remains sidelined with a knee injury. The Patriots offense was held to 3.4 yards per carry. Robert Thomas notched a sack along with 3 tackles, proving his multi-down threat. He fought hard to get off blocks, showing quick and strong hands and a relentless engine. Kerry Wynn made the defensive play of the night, tipping a Jacoby Brissett pass to himself and returning it for a 15-yard touchdown in the first quarter. To think about how far he has come in his young four-year career is a proof-is-in-the-pudding development that shows sometimes being patient with these high-upside, high-character young guys can really pay off. He has become an important piece to this potentially dominant defense. Devin Taylor hasn’t showed enough in his short tenure with the club. He is too slow off the ball and struggles to get movement on blockers. Too many plays do I have the “NF” (Non-Factor) next to his name. Same can be said for Stansly Maponga, a hybrid DE/OLB who just doesn’t fit with this scheme nor has he shown the needed athleticism. Rookie Avery Moss was all over the field. Both DE spots, pass rushing OLB, coverage OLB, and pass-rushing DT. The tools are there, he just needs to put his best foot forward in the weight room. He isn’t powerful enough yet but there is a play-maker somewhere in there. Jordan Williams and Josh Banks, both a tad undersized for interior play but too big and slow for the outside, get off the ball well but both were struggling to get off their blocks. They were beat on a few of the Patriots more positive running plays. B.J. Goodson, Devon Kennard, Jonathan Casillas, and Keenan Robinson (injury) did not play. Curtis Grant saw the most action in the group and responded with 8 tackles, the most on the team. He is an excellent interior defender, as he can explode into 3-5 yard creases with power and presence. Very good tackler who makes the effort to wrap up violently. He was exposed in space a few times. Grant is not a poor athlete but he does have trouble reacting laterally and in coverage. Fellow backup and roster hopeful Deontae Skinner added 3 tackles while roster probable Calvin Munson recorded 2. Munson is less physically gifted but he has proven to be the most instinctual backup they have and, when it comes to that position, instincts trump all. J.T. Thomas got the most live action he’s seen in almost a year and he didn’t disappoint. He had 4 tackles a forced a fumble. Thomas showed a physical brand when tackling and filling lanes to meet blockers. He was very impressive against the backups of NE and could end up being the athletic but powerful backup they need on the weak side. Janoris Jenkins, Dominique Rodgers-Cromartie, Michael Hunter, and Eli Apple all remained on the sideline. This position group has seen as much turnover as any on the team. The top 4 seemed pretty much locked in, thus I think these guys were competing for a practice squad spot or two and the final spot on the 53-man roster. DaShaun Amos has been with the team all offseason and preseason, and his size/speed combination were on display against the Patriots. He is a smooth transition guy, very important for the man coverage scheme. Tim Scott was in on a lot of action. He allowed a few passes to be completed in his direction but he played a physical downhill style. He made an impression on me in his 2 games here. Tay Glover-Wright allowed a touchdown pass, struggling to control his body when locating the ball. Donte Deayon only played early on, but he was beat for a 1st quarter TD matched up against Cody Hollister. It was a play that further exposed Deayon’s glaring weakness, his size. He just doesn’t have a lot of range when attacking the ball against a receiver and he is so easily moved. I think he has an inside track at making this team but he needs to be avoided when it comes to placing these CBs in certain roles. Darian Thompson got the start, as he simply needs more and more experience. The second year, projected starter next to Landon Collins is still extremely raw when it comes to reading and reacting to NFL offenses. Nat Berhe gave his weekly missed tackle when he tried to take down Austin Carr on his way into the end zone. There is such a thing as a player who is too aggressive, and Berhe is exactly that. The issues that a poor-tackling safety can present could really damn a defense. I respect his presence considering his size, but is this a guy who will hurt the Giants as much as help? More? Kicker Aldrick Rosas went 4-fo- 4, including the game-winning 48-yarder. It was good to see him respond positively to a pressure situation. Even though it was a low-intensity preseason game, the Giants would have lost if he missed. Rosas went 8-for-8 in preseason games and as far as I’m concerned, did everything right to deserve the job. What New England does with their backup QB situation is going to be one of the more interesting personnel situations in the league next year. Jacoby Brissett has shown enough in his now two preseasons and the 2016 regular-season to warrant backup duty. If that is the case, teams looking for a starting QB next year could skip the development process by trading a 1st round pick for Jimmy Garoppolo. Two players who I wanted the Giants to draft in the 5th and 6th rounds respectively, were both taken by the Patriots. OT Conor McDermott played a very solid RT and LB Brooks Ellis showed what liked in college (a big and physical guy with enough speed paired with excellent instincts). If either one of these guys shakes loose via roster cuts, NYG should give them a hard look. When a Patriots pass catcher goes down, there is always someone that comes out of nowhere it seems. Austin Carr is a name that my boss at Ourlads was all in on from last fall all the way through the draft process. Austin Carr is the reliable route running, catch-everything no-namer that all of you may be adding to your fantasy roster soon if he can get on that 53-man roster. The New York Giants and New England Patriots have been playing against each other in the 4th preseason game since 2005. Last year was a bit of a roll reversal for each team as it was the Giants who sat most of their starters while New England played their starters, including Tom Brady. The Giants back-ups actually performed admirably well in that game. We don’t know how Bill Belichick will approach this year’s game, but Ben McAdoo already made it known he will handle the game like he did last year. So aside from the list of injured players below, don’t expect Giants’ stalwarts like Eli Manning, Brandon Marshall, Damon Harrison, Jason Pierre-Paul, Olivier Vernon, Janoris Jenkins, Dominique Rodgers-Cromartie, and Landon Collins to play. We may not eve see guys like Sterling Shepard, Dwayne Harris, Shane Vereen, and Rhett Ellison. Last year, Weston Richburg did not play and the other starters on the offensive line only played a handful of snaps. Long story short, this is less of a competitive contest than an evaluation period for the bubble players right before Saturday’s massive cut-down deadline. The biggest story line offensively for the Giants will be this is the final audition for the back-up quarterbacks. On Saturday, Geno Smith or Josh Johnson will be cut. And if both struggle against the Patriots, while unlikely, it is not out of the realm of possibility that the Giants cut both. Smith has looked like the more legit NFL quarterback this preseason, but as demonstrated throughout his short NFL career, he has also been guilty of the ugly turnover. Johnson simply has not impressed. At the bottom of the depth chart is Davis Webb, who hasn’t received nearly enough practice and preseason snaps to probably seriously contend for the #2 job. A shot-gun QB in college, he’s still learning the basics of NFL footwork. Because Shaun Draughn simply was not able to stay healthy, the running back situation is easier to figure out. Paul Perkins will be the starter. Shane Vereen will probably rival him for snaps/playing time. Orleans Darkwa will probably be the short-yardage back. Wayne Gallman is the developmental prospect who will probably struggle to be active on game day. My guess it the top three tight ends are Evan Engram, Rhett Ellison, and Jerell Adams. Will the Giants carry four? Or will they opt to go with a fullback (Shane Smith)? This is a HUGE game for Smith and tight ends Matt LaCosse and Will Tye. 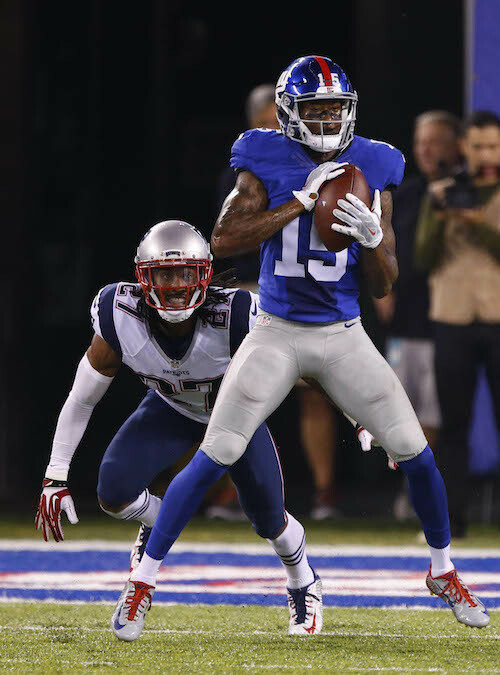 At wide receiver, the Giants will surely sit Odell Beckham and probably Brandon Marshall and Dwayne Harris. It will be interesting to see if Sterling Shepard plays. Heading into camp, Tavarres King had the inside track to the #5 wide receiver position, but he has missed a lot of time. Is his job safe? Could the Giants only carry five receivers? Roger Lewis and Travis Rudolph are fighting for their NFL lives. Both have been “fortunate” to see many of the other contenders fall by the wayside due to injury (Darius Powe, Keeon Johnson, Kevin Snead, Kevin Norwood). Lastly, this brings us to the Giants Achilles’ heel: the offensive line. Does McAdoo give the starting five extra time to prepare for the Cowboys? Or does he do what he did last year and only play the starters for about 10 snaps? Media and fans were excited to see Brett Jones replace John Jerry at right guard against the Jets, but Jerry was back at right guard with the first team this week at practice. Really, the questions here for this game is how many back-up offensive linemen do the Giants keep? And who? They will surely be actively scanning the waiver wire for upgrades. Jones may not be safe. He’s probably fighting Jon Halapio for the reserve center/guard spot. Is D.J. Fluker are sure thing? He may not bring a lot of versatility in terms of position interchangeability and he did not appear to seriously challenge Jerry. Undrafted rookie free agent Chad Wheeler has out-performed 6th-round pick Adam Bisnowaty. Do both, one, or none of these two make it? The starting defense is ready. Ben McAdoo would be crazy to play his best defensive players, specifically Jason Pierre-Paul, Olivier Vernon, Damon Harrison, Janoris Jenkins, Dominique Rodgers-Cromartie, and Landon Collins. 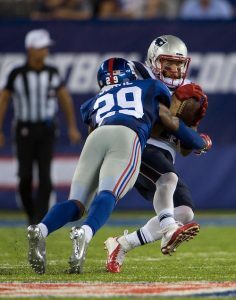 Factor in that injured players Eli Apple, Michael Hunter, Jay Bromley, and Keenan Robinson won’t play and Giants fans should not read anything in terms of the team’s defensive performance against the Patriots. Other than possibly Donte Deayon, none of the corners playing in this game will make the team. (Let that sink in before you starting bitching on the game thread about our secondary). The injury to Jay Bromley complicates things for the Dallas game. Bromley says he will be ready, but players usually are overly optimistic with the press. Dalvin Tomlinson or Robert Thomas may be seeing more snaps in the opener than expected. At end, we know who the starters are. Kerry Wynn seems to be in the lead for the top reserve defensive end spot, but none of the reserves have really stood out as pass rushers in the preseason. Romeo Okwara, Devin Taylor, and Avery Moss have been quiet. One guy who may have sneaked his way into the picture is DE/DT Jordan Williams. He has flashed. This game is an important contest to all of these players. While the Giants’ sub-par secondary is getting burned, it will be more important for fans to keep an eye up front to who almost gets to the quarterback. At linebacker, Mark Herzlich has been sidelined for weeks with a neck injury. How serious is it? Might he end up on IR? That would open things up for other reserves and/or waiver wire pick-ups. The sure bets are Devon Kennard, Jonathan Casillas, B.J. Goodson, and Keenan Robinson. There is very little depth here, especially when you consider Robinson is already battling his second concussion of the preseason. J.T. Thomas should be thanking his lucky stars. One guy to watch is Calvin Munson. The place-kicker competition this preseason has been as good as I can ever remember. Neither has missed and both have impressively nailed kicks from 50+ yards. This literally may come down to the last kick. Dwayne Harris’ absence has meant we haven’t had a serious look at our return game this preseason. I think this is a good football team. But the offensive line, running game, and place kicker could sabotage the season. There are also serious depth concerns at linebacker and safety. The ankle situations for Odell Beckham and Eli Apple could be a problem, at least in the short-term. But this Giants defense may be the best the team has had since 2007, and maybe better. This is certainly the most talent group of receivers Eli Manning has had since 2011. This is a team that should be a serious Super Bowl contender. As for this game, the key players to watch are the quarterbacks, place kickers, fullback versus reserve tight ends, defensive ends, and linebackers. 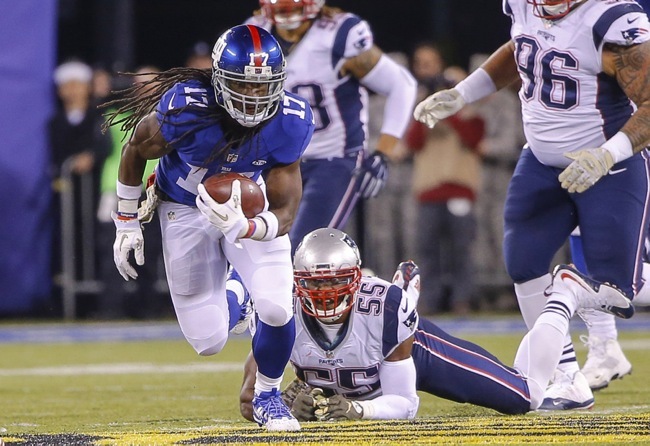 The Giants and Patriots have been playing each other in the preseason finale for years. In a bit of a role reversal, it was the Giants who sat most of their top players while the Patriots actually played quarterback Tom Brady the entire first half. Surprisingly, a mostly second- and third-team defense forced three first-half turnovers and held Brady’s high-powered offense to just six points. Without Eli Manning and Odell Beckham, and behind continued shoddy blocking and poor back-up quarterbacking, the offense continued to struggle. But there was just enough good defense interspersed with some offensive production to come away with a 17-9 victory. The Giants come out of the preseason mostly healthy. The primary health concerns are fullback/tight end Will Johnson (burner), linebacker Jonathan Casillas (ribs), and safety Darian Thompson (shoulder) – all of whom will hopefully be able to play against the Dallas Cowboys on September 11th. The defense has made great strides, but will the offensive line flip a switch and play much, much better than it did in the four preseason games? Quarterback Eli Manning, wide receiver Odell Beckham, and center Weston Richburg were healthy scratches. Out of their seven first-half possessions, the Giants had two long drives: one a 15-play, 59-yard possession that ended with a 25-yard field goal; and the second a 6-play, 63-yard possession that ended with an interception at the Patriots 2-yard line with seven seconds left in the half. The Giants generated seven first downs on these two drives and just three first downs on the other five drives. In the second half, the Giants had four drives (not counting the last one where the team was merely attempting to run out the clock). Two of these drives resulted in touchdowns and the two others with punts. The first scoring drive was a 4-play, 86-yard affair with the big play coming on the 59-yard catch-and-run by wideout Tavarres King. The second scoring drive was a 13-play, 79-yard march that ended with a 17-yard touchdown reception by wide receiver Roger Lewis. Eli Manning was a healthy scratch. Heading into the last year of his rookie contract, this was a terrible preseason for Ryan Nassib. He obviously regressed from his strong 2015 preseason. Why? He’s in the same system and received far more playing time with the first unit than he ever has. Frank Cignetti, Jr. became the new quarterback coach this offseason but it’s hard to believe that Cignetti would be the reason. Regardless, Nassib did not play with a lot of confidence and never looked terribly comfortable. He played with poor offensive lines in his three other preseasons. Oddly, his arm strength was terribly inconsistent. Nassib’s touch and accuracy just appeared off in all four games. Nassib finished this game 16-of-29 for 210 yards, one touchdown, and one interception. 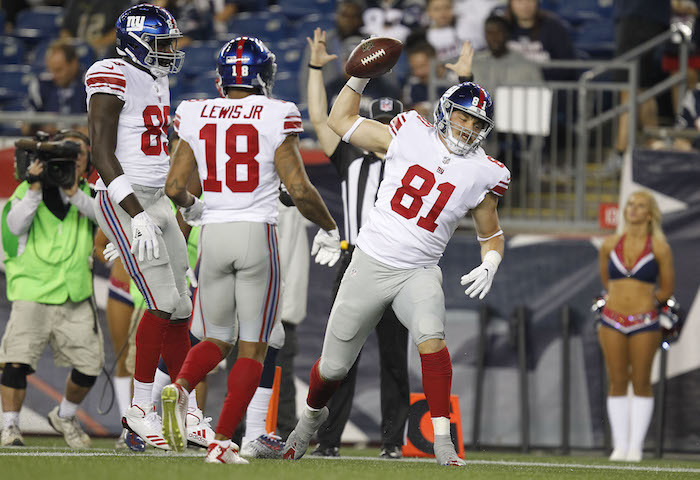 Nassib did have his moments, like his well-thrown 13-yard out to WR Sterling Shepard in the 1st quarter and his 9-yard throw to WR Tavarres King in the 2nd quarter. At least three of his deep sideline throws were out-of-bounds. Nassib was also fortunate that a Patriots penalty erased a fumble on play where he should have thrown the ball away or simply fallen to the ground. Logan Thomas entered the game mid-way through the 4th quarter and led the Giants on a 13-play, 79-yard, 6-minute touchdown drive that put the game away. Thomas was 3-of-5 for 39 yards and a well-thrown 17-yard touchdown pass. All that said, Thomas never threatened the struggling Nassib in training camp and the preseason. He also fumbled a shotgun snap on the touchdown drive that was fortunately recovered. Bobby Rainey (7 carries for 38 yards, 3 catches for 37 yards), Orleans Darkwa (9 carries for 37 yards), and Andre Williams (10 carries for 35 yards) all had their moments against the Patriots. Paul Perkins had 3 catches for 29 yards, but also fumbled the ball away on one of his two carries and dropped a pass. Both Darkwa and Williams impressed with their tough running between the tackles despite less-than-ideal run blocking. Rainey had some decent runs out of the shotgun formation and is a more slippery runner and receiver. Odell Beckham was a healthy scratch. Victor Cruz only played nine snaps. He got little separation on two deep routes against corner Malcolm Butler on the first series, including the only time the ball was thrown his way (incomplete). Same story against corner Logan Ryan on the first play of the next series. He was open on a drag route but the ball went elsewhere. Cruz’s best play came when he then beat Butler with a quick move at the line and got behind him. However, Nassib didn’t see the wide open Cruz. Sterling Shepard didn’t play long. He caught 1-of-2 passes thrown in his direction for 13 yards. His first opportunity was a deep pass also against Butler, but like Cruz, Shepard could not create any separation. Two plays later, Shepard picked up the first down with an out route on 3rd-and-10. The leading wide receivers were Tavarres King (4 catches for 80 yards and a touchdown), Roger Lewis (3 catches for 30 yards and a touchdown), and Geremy Davis (3 catches for 30 yards). King’s 59-yard catch-and-run was the play of the night as he easily ran away from two defenders. Lewis had a 7-yard reception on 3rd-and-5, King a 4-yard reception on 3rd-and-2, and King a 9-yard reception on 3rd-and-6 on the Giants field goal drive. Lewis couldn’t handle one fastball on a crossing pattern. Davis made a couple of outstanding sideline catches including a 16-yard back-shoulder reception. Interestingly, the Giants decided to sit Weston Richburg as a healthy scratch with Brett Jones getting the start at center. Had Justin Pugh (shoulder) not missed so much time, he probably would have sat too. The other three starters – Ereck Flowers, John Jerry, and Marshall Newhouse – need the work. The starters – minus Richburg – only played nine plays. After decent pass protection on the first pass play, the next left-side running play lost four yards. On 3rd-and-14, both tackles allowed pressure on Nassib, whose arm was hit as he threw. Both Flowers and Newhouse allowed pressure on the next drive on the same play. Brett Jones then failed to spot the inside blitz as Nassib was sacked just after he received the snap. The second-team offensive line featured LT Bobby Hart, LG Adam Gettis, OC Brett Jones, RG Emmett Cleary, and RT Ryan Seymour – as the Giants were clearly trying to determine which linemen were the most versatile. Later Gettis played center and Jones left guard. I’m not sure there is a viable NFL player in this group. Gettis in particular struggled in pass protection. The interior had issues identifying inside dogs. Hart couldn’t make his block on a running play that lost three yards and didn’t appear very physical or powerful overall playing on the left side. He later gave up a sack on 3rd-and-2 in the 4th quarter. Cleary was flagged with a holding penalty on a running play in the 3rd quarter. The tight ends did a much better job of blocking this week. That said, I would like to see Donnell sustain his blocks longer and keep his man out of the play. In the receiving department, Donnell was targeted three times with one catch for 30 yards. Jerell Adams had one pass thrown in his direction but did not have a reception. Will Tye was not targeted. The Giants sat their best defensive players. Defensive ends Jason Pierre-Paul and Vernon Olivier, defensive tackles Damon Harrison and Johnathan Hanks, and cornerbacks Janoris Jenkins and Dominique Rodgers-Cromartie did not play. Neither did the walking wounded: linebacker Jonathan Casillas (ribs), linebacker Jasper Brinkley (knee), linebacker B.J. Goodson (concussion), cornerback Leon Hall (concussion), and safety Darian Thompson (shoulder). Patriots quarterback Tom Brady played the entire first half against mostly a second- and third-team Giants defense that performed admirably well. In six first-half Patriots drives, the Giants forced three turnovers and allowed only one scoring drive: a 9-play, 67-yard effort that ended with a 7-yard touchdown pass by Brady. The 2-point conversion attempt failed. The Giants defensive reserves remained stingy in the second half, allowing only one scoring drive: a 16-play, 66-yard march that resulted in a 32-yard field goal. Three other drives ended with punts and one drive on downs. With the entire starting defensive line sitting, the starters on Thursday night were left defensive end Kerry Wynn, defensive tackles Louis Nix and Jermelle Cudjo, and right defensive end Owamagbe Odighizuwa. Wynn got a few good early pass pressures on Brady and finished with two QB hits. Romeo Okwara also continued to flash with his pass rush. Odighiuwa had two quarterback hits as did Montori Hughes, Stansly Maponga, and Jay Bromley. In all, the Giants reserve defensive line had an astounding 11 quarterback hits (this doesn’t count numerous other QB pressures). For example, Okwara got good pressure on the Patriots failed 2-point conversion attempt. Hughes also recovered a fumble. Odighizuwa tipped a pass. Wynn forced a fumble ending a Patriots drive deep in Giants territory, hustling all of the way from the opposite side of the field. Cudjo penetrated to tackle the running back for a 3-yard loss in the 2nd quarter and chased down the back for a 2-yard loss in the 3rd quarter. An unblocked Okwara picked up a sack after the former play by Cudjo. In the 3rd quarter, Jay Bromley and Louis Nix combined to nail the back for a 1-yard loss. Hughes also looked good stuffing one inside run and had a 4th quarter sack. Cudjo tipped a 3rd down pass early in the 4th quarter on a play where Odighizuwa smashed into the quarterback. Jonathan Casillas (ribs), Jasper Brinkley (knee), and B.J. Goodson (concussion) did not play. The Giants started the game in their nickel package with linebackers Kelvin Sheppard and Keenan Robinson on the field. Sheppard was flagged with a defensive holding call on an incomplete 3rd-and-13 pass. Robinson followed this up with nice coverage on TE Martellus Bennett who was split out wide. On the Patriots scoring drive, it appeared that Sheppard got illegally picked on a 30-yard reception by the running back. Mark Herzlich recovered a fumble in the 2nd quarter and ran through the blocking back for a 7-yard sack in the 3rd quarter. Herzlich had a shot at another sack on the next series but overran the QB who scrambled for a 12-yard gain. Two plays later, the Pats back broke off a 16-yard run as he squirted past Herzlich who got blocked on the left-side run. Later on this drive he was flagged with an unsportsmanlike conduct penalty for a late hit. J.T. Thomas seemed a step slow this week both against the run and the pass. Brad Bars simply doesn’t look athletic enough in space. Starting corners Janoris Jenkins and Dominique Rodgers-Cromartie were healthy scratches. Cornerback Leon Hall (concussion) and safety Darian Thompson (shoulder) also did not play. Starting the game at corner were Eli Apple, Trevin Wade, and Donte Deayon (nickel). Landon Collins started at strong safety and Nat Berhe at free safety. Wade and Apple had strong games. Wade expertly caused a 3-yard loss on a WR-screen on the Patriots’ first offensive snap. 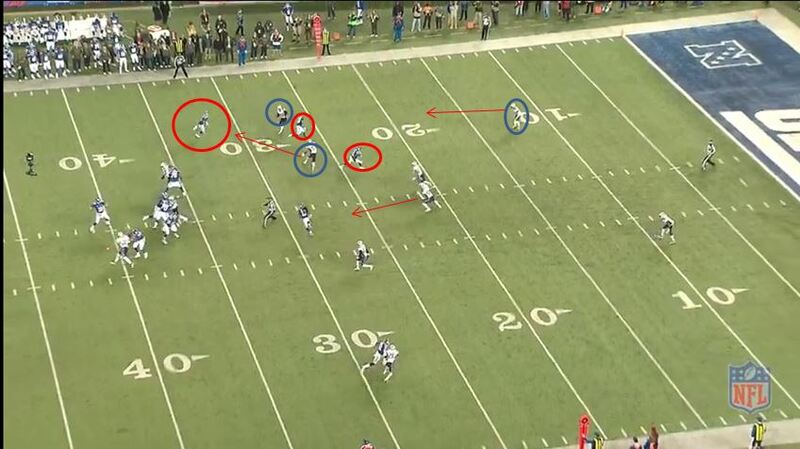 Apple then had excellent deep coverage on WR Julian Edelman deep. A few snaps later, Wade did a tremendous job of reading the route, reacting to the throw, and coming away with an interception of Tom Brady. Later in the quarter, Deayon gave up a 16-yard reception on 3rd-and-7. Collins did a nice job of reading a short 3rd-and-2 pass but misplayed the ball on a play where he should have picked off Brady and possibly scored. Later in the 1st quarter, Wade made a sure tackle in space after a short throw. Apple had solid deep coverage on the very next snap. The Patriots finished up this drive with a touchdown when Apple got hung up with Adam Andrews with two Pats receivers bunched to one side. Safety Andrew Adams was credited with a forced fumble, but the intended receiver really just dropped the ball on his own. Corner Michael Hunter got beat on a slant and then a 38-yard deep pass in the 2nd quarter, though he stayed with his man on another deep shot into the end zone on the next snap and later knocked down another Brady deep pass on 3rd-and-20. Deayon missed a couple of tackles after the catch in the 3rd quarter. Corner Leon McFadden got successfully targeted a couple of times and was fortunate he wasn’t called for pass interference on a late deep shot into the end zone on 4th-and-1. Josh Brown did not play as the Giants prepped Randy Bullock for the opener. Three-of-four of Bullock’s kickoffs resulted in touchbacks. The Patriots returned one kickoff 25 yards, but they were holding on the play. Bullock also made his only field goal effort: a 25-yarder. Bobby Rainey returned two punts, one for 13 yards and one for three yards. He returned one kickoff for 32 yards. Dwayne Harris did not return any punts or kickoffs. Brad Wing punted seven times, averaging 44.1 yards per punt with one touchback and one punt downed at the 6-yard line. Punt coverage continues to remain a problem as the Giants allowed a 34 yard punt return with the gunner, Tavarres King, missing the initial tackle. The fourth preseason game always bugs me. The coaches never want to play the starters very long. But with the roster being reduced to 75 only days before and the always-present not-playing-because-of-injury players, you have guys risking injury who probably should be sitting on the bench. Reading between the lines, it doesn’t sound like the Giants starters will play much, and some may not play at all. Even if they do, Bill Belichick usually sits most of his starters. So nothing should be really made out of this game other than individual performances. My advice? Watch your favorite players and don’t get too worked up over anything. Whether the offense succeeds or fails as a unit is largely immaterial in this game for the reasons I stated above. So let’s focus on the final roster decisions. 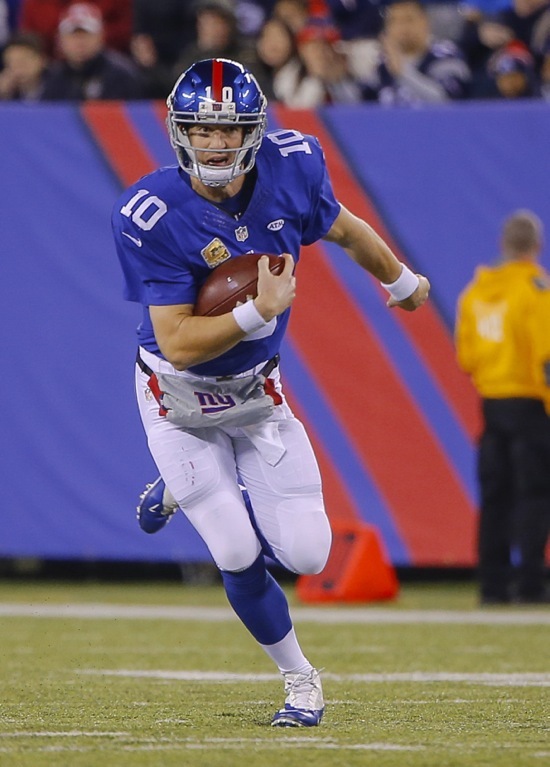 Quarterbacks: Eli Manning and Ryan Nassib will be the quarterbacks. Logan Thomas will be cut. 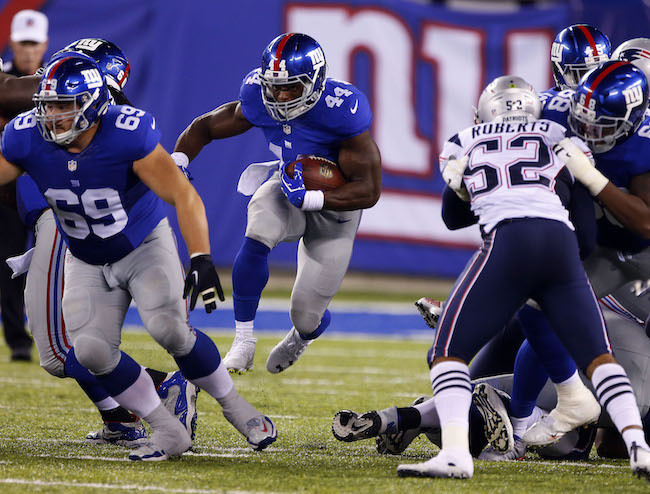 Running Backs: The sure bets are Rashad Jennings, Shane Vereen, and Paul Perkins. Do the Giants keep one or two more backs? It’s hard to envision the team being able to keep Bobby Rainey. My guess is Andre Williams makes the roster with Orleans Darkwa on the bubble. Tight Ends/Fullback: The injuries to Nikita Whitlock and Matt LaCosse make this easy. Larry Donnell, Will Tye, and Jerell Adams will be the tight ends. Will Johnson will serve as a fullback/H-Back/tight end swingman. 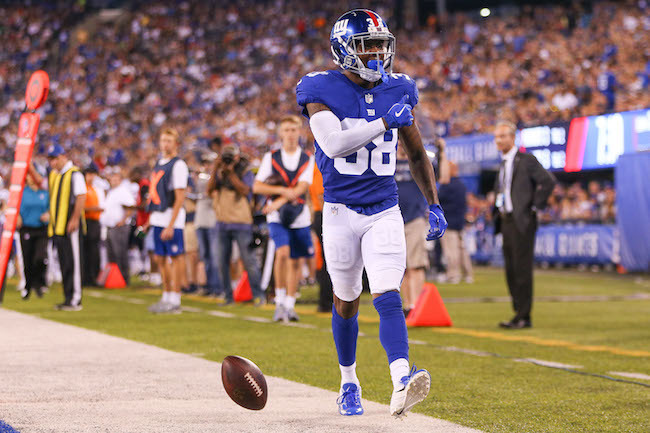 Wide Receivers: The Giants will probably keep six. The sure bets are Odell Beckham, Sterling Shepard, Victor Cruz, and Dwayne Harris. Geremy Davis probably makes it with Tavarres King and Roger Lewis fighting for the last roster spot. This is a big game for those two. Offensive Line: The sure bets are Ereck Flowers, Justin Pugh, Weston Richburg, John Jerry, Marshall Newhouse, Will Beatty, and Bobby Hart. The eighth lineman may not be on the roster yet. Somebody being cut by another team has to be better than Adam Gettis, Emmett Cleary, Brett Jones, Ryan Seymour, Dillon Farrell, and Jake Rodgers. Jerry Reese didn’t do a very good job of addressing this unit in the offseason despite still having a lot of $$$ to play with. 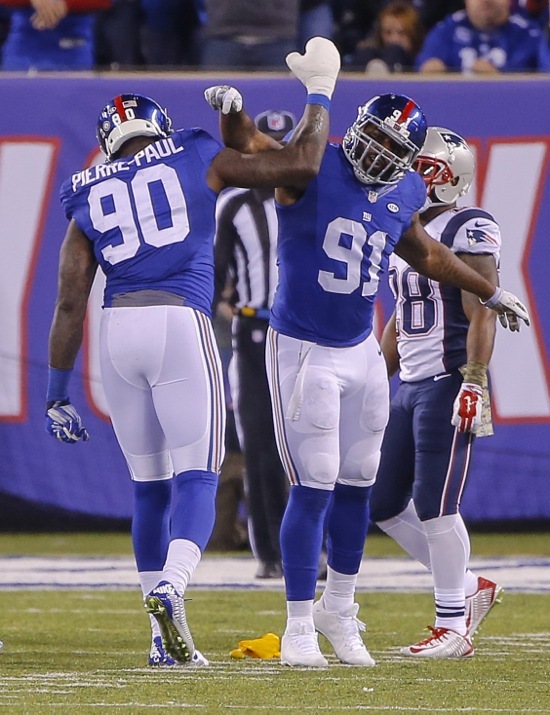 Defensive Line: My guess is the Giants go top-heavy with defensive ends with Jason Pierre-Paul, Olivier Vernon, Owamagbe Odighizuwa, Kerry Wynn, and Romeo Okwara all making the team. Defensive tackle is trickier. It’s not a given the Giants will keep four, but they probably will. Damon Harrison and Johnathan Hankins are the starters. The Giants will give Jay Bromley one more season. This is a big game for the remaining three tackles: Jermelle Cudjo, Louis Nix, and Montori Hughes. Linebackers: The Giants will probably keep seven. Devon Kennard, Jonathan Casillas, Jasper Brinkley, Kelvin Sheppard, and B.J. 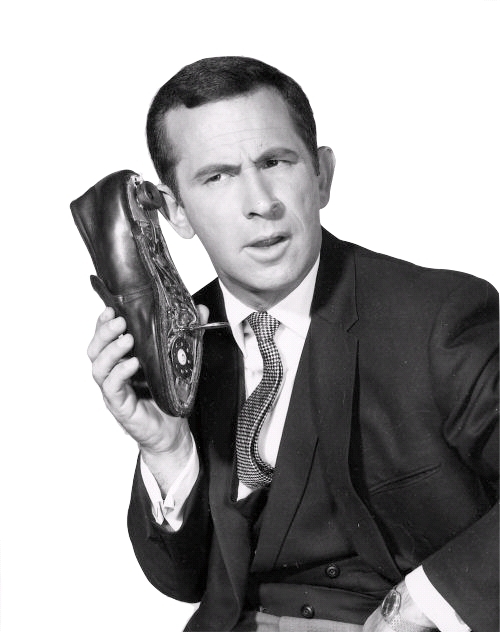 Goodson all seem like safe bets. Keenan Robinson, J.T. Thomas, and Mark Herzlich seem to be fighting for two roster spots. Defensive Backs: The Giants will probably keep five corners and four safeties. They might go with six corners if they go light someplace else (i.e., one fewer running back or defensive tackle). The definites are Dominique Rodgers-Cromartie, Janoris Jenkins, and Eli Apple. Leon Hall, Trevin Wade, and Donte Deayon may be fighting for two roster spots. With the earlier cuts, safety is easier to figure out. Darian Thompson and Landon Collins will be the starters. Nat Berhe, Mykkele Thompson, Andrew Adams, and Justin Currie are fighting for two spots. Based on who has been receiving first-team reps, Berhe and Thompson are probably the favorites. The punter is Brad Wing and the long snapper is Zak DeOssie. Dwayne Harris will be the primary kickoff and punt returner. Unless the Giants see someone even better on the waiver wire, Randy Bullock will be the opening-night kicker. Do the Giants go back to Josh Brown after that game or part ways with him? We missed it by THAT much! The keyboard is staring at me, mocking me in its own qwerty way. It knows I slapped it on Sunday afternoon, but it’s not sure why. It wasn’t a hard slap, just a “here we go again” 4th-quarter meltdown-turned-comeback-turned-meltdown slap that let it know “Hey pal, we’re in this together until the end.” Indeed for Tom Coughlin and his band of misfit toys, there was no happy ending this time against the undefeated New England Patriots as Stephen Gostkowski’s 54-yard please-go-wide left kick sailed inside the uprights. It was not a most-gripping victory for the home fans as our own Prince Akeem looked on in street clothes. Up 20-10 after a 2nd half opening FG drive, the Giants’ defense forced a quick 3-and-out from Tom Brady and the world’s most dangerous group (NWE not NWA now hold that distinction). Four plays later, the Giants let the Patriots off the ropes by surrendering an 82-yard punt return to Danny Amendola that turned into a 3-play, 7-yard TD drive that seemed to wake up the groggy Pats’ offense and cut the home team’s lead to just 3. Eli Manning and company answered on a 45-yard FG drive that pushed the lead to 23-17, but it was the failure to find the end zone that would ultimately doom the G-Men’s chances to pull off a MetLife Miracle and upend the unbeaten Patriots for a second time. MLB Jasper Brinkley was having none of it and came up with a sack strip of Tom Brady to give Eli just 31 yards to put the game out of reach. As they did all afternoon, the Patriots answered the bell, sacking Manning on the drive’s first official play, pushing the ball back to the 44 yard line and forcing a quick 3-and-out when a score could have pushed this game out of reach. After being bottled up most of the day by journeyman safety Craig Dahl, TE Rob Gronkowski, who was thwarted in Super Bowl 46, got his revenge with a 76-yard catch-and-run that pushed the Pats ahead 24-23. Another punch-less offensive effort by the Giants that force fed the ball to a blanketed Odell Beckham Jr. gave dimple chin the ball and the chance to put the game away. After driving his team 81 yards and seemingly taking a 30-23 lead, a holding call wiped out a LeGarrette Blount TD, Tom Brady did the unthinkable and threw an interception to CB Trumaine McBride at the 1-yard line and suddenly the Giants’ 4th quarter Eli Manning magic looked to be coming back to claim the Patriots. Twelve plays later, he did it; Eli pushed the lead to 29-24 with a 5-yard TD pass to Odell Beckham Jr., who had been held in check since a first quarter TD that ate up 87 yards. Only he didn’t. Replays showed that Beckham got two feet down but failed to make a “football move” in the end zone as CB Malcom Butler swatted the ball out of his hands. A Josh Brown FG inched the Giants closer to the miracle with a 26-24 lead but clumsy play calling and execution left 1:46 for Tom Brady to pick his way down field. Rookie S Landon Collins then stepped in with the biggest non-play of the season, leaping high for a hurried Brady pass and seemingly ending the game with a clutch interception but it was not to be as the ball squirted out and gave #12 another chance to ruin the day. True to form, Brady came through this time against his nemesis and delivered the ball to the Giants’ 36-yard line. Gostkowski’s boot (he too is perfect on the season) ended the chance for the 2015 Giants to match their 2007 predecessor’s feat of ending the Patriots perfect season. So Mr. Lenovo laptop, you can blame me for the sudden jolt, but really your ire should lay with Tom Coughlin or Eli Manning, or Landon Collins or Odell Beckham or Tom Brady, anyone but me old friend. So the debate will rage, was Eli great or the goat for the clock mismanagement as the Giants drove to take the lead in the 4th quarter? His heady slide in bounds forced the Patriots to use their final timeout but the inexplicable timeout with 2:06 left and the clock winding down to the 2 minute warning will haunt this game as long as it’s discussed. The timeout seemed to pay off with a TD pass to Beckham, but after the review negated it, the Giants had one more play to run before getting to the 2-minute warning. With 2:01 left, Manning completely missed a wide open Beckham underneath for a sure TD and the ball sailed wide of WR Dwayne Harris. It may be a matter of seconds, but not stopping the clock with 2:06 left may have forced the Patriots to use their final timeout there or at least had the Giants with 1st-and-goal at the 5-yard line with 2 minutes left. At that point, you can safely run the ball even against the Pats 6 DL formation on 1st and 2nd down, forcing the Pats to spend their final timeout and then running the clock down before your 3rd down play. That would have reduced the final time for Brady to less than a minute, but as Coughlin said, he was playing for the TD and rightly so. I posit the argument because that’s what gets discussed ad nauseum but in reality this game was far too close to pin on any one thing. Late game confusion aside, Eli was again terrific against Tom, piling up 361 yards and two TDs and leading the Giants to six scoring drives, the first of which was a perfectly placed ball to Beckham who split coverage on his way to an 87-yard TD that evened the game at 7 on the Giants’ opening sortie. Manning consistently drove the team down the field but against Belichick’s vaunted umbrella defense that gets tighter to succeed against as you drive inside the 20, FGs were the rule and not TDs. Manning’s first-half 2-minute TD drive was vintage Eli. First was a perfect sideline pass to Rueben Randle, a dime to Harris to keep the drive alive and a seam to Will Tye to get the G-Men to the 1-yard line. The exclamation point was a perfectly-arced fade pass to Dwayne Harris to close out the first half and put the Giants ahead by 7. Manning’s non-TD pass to Beckham was again perfectly placed. But in a game of inches, the ball being slapped away was another in a long line of plays that had they gone the other way, see the Giants to victory. Eli contributed to the Giants’ rushing total with a 10-yard uh, jaunt we’ll call it on the Giants’ opening drive of the second half. Not a lot of good here when your longest rush of the day comes from your 34-year old QB who’d probably rather watch another Nationwide commercial of his chicken parm-loving brother than take off running. Rashad Jennings “led” the group with 11 carries and 39 yards but the inside trap play that had become this groups bread-and-butter was simply stuffed all day by the Pats. Former Pat Shane Vereen predictably was bottled up by his previous employers, contributing only 26 total yards and really having no statistical impact on the proceedings aside from a 3rd-down conversion early in the 2nd quarter. Vereen’s presence out of the backfield was crucial however, as we will show later in a breakdown of his impact on the Patriots’ coverage schemes. 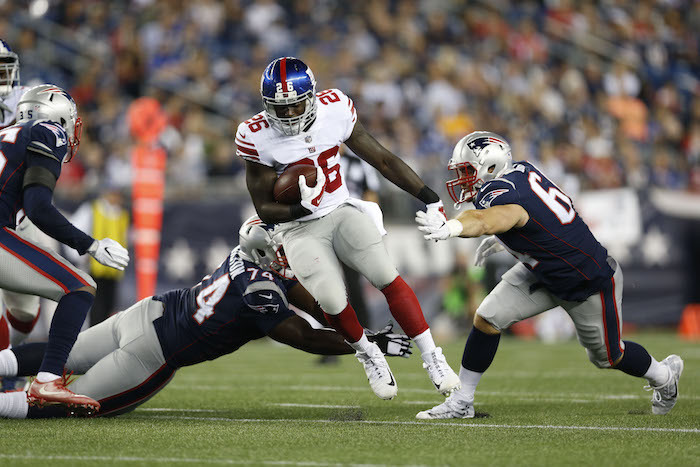 Personal RB favorite Orleans Darkwa had two tough runs for 9 yards but was held to 6 on his other 3 totes. WR Odell Beckham Jr. started the day with a bang, knifing through the Patriots’ secondary for an 87-yard TD on the Giants’ second offensive snap. Tough sledding from there on out against Super Bowl hero Malcolm Butler including Butler’s quite frankly mean slap away of a TD late in the 4th quarter that could have been the game clincher. Beckham was challenged physically all day by Butler and honestly lost the battle after an opening haymaker. OBJ finished with 104 yards on 4 catches but was targeted a team-high 12 times. Give Butler credit for clamping down on the dynamic sophomore playmaker. Dwayne Harris again came up big for Eli with 82 yards on 6 catches with a TD and consistently providing a safety valve underneath for his QB. Harris just missed a diving pass from Manning on the goal line on the Giants’ game tying drive late in the first half. It was another play and another few inches short of where this team wants to be, truly the story of the afternoon. Myles White contributed one catch but it was a 28-yard sideline beauty that had the Giants in position to score. White also appeared to be interfered with on a Manning pass into the end zone, but in a game that saw plenty of hand fighting in the secondary, it was an understandable no-call given how the game was officiated all day. Rueben Randle again chipped in with a crucial catch to spur a Giant scoring drive as the first half closed. Randle’s impact wasn’t FanDuel great (sorry Fantasy junkies) but his 51 yards on 3 catches was enough to keep the Giants toe to toe with the unbeaten Pats. As with everyone else though, there was a play Randle will want back – when he pushed off to negate a 11-yard gain which would have had the G-Men to the Pats’ 20 up by 6 points and driving. The ensuing play was DE Rob Ninkovich’s sack of Manning which effectively ended any scoring threat. Will Tye is starting to assert himself, but like many of the young Giants has some room to improve. Tye pulled down 5 balls for 56 yards but it was the just miss of a potential TD from Manning that will stick in the rookie’s craw as will a flat out drop from Manning as the Giants drove to close out the first half. Tye rebounded quickly to snag a Manning pass that covered 31 yards and got the Giants in possession of a 17-10 halftime lead. Tye’s edge blocking was better. The rookie TE is improving technique wise, keeping a wide base and keeping his feet under him to maintain good leverage in the running game. Exploiting a tendency. Notice on TE Will Tye’s 31-yard rumble down to the Patriot 1, Offensive Coordinator Ben McAdoo spotted a weakness two plays earlier on a formation that saw Beckham, Vereen and Tye on the play side. Knowing that Belichick is committed to shading or doubling an opponent’s best weapon(s), the Giants tried Beckham down the right sideline with Vereen coming out of the backfield to see what type of coverage they would get. 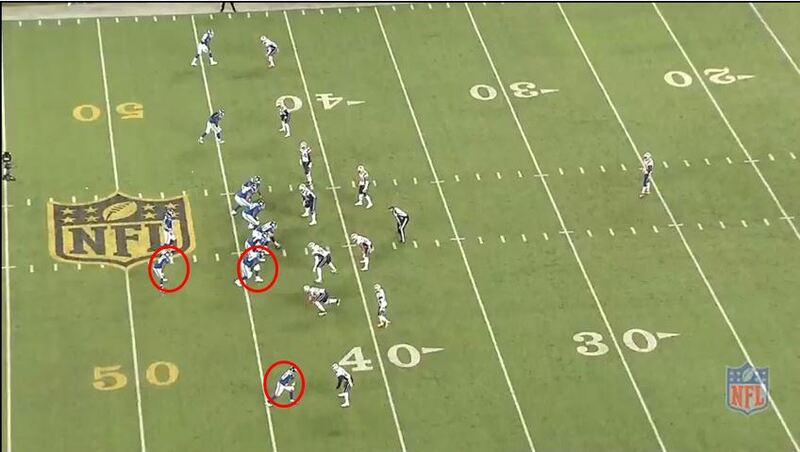 Two plays later, that tendency to shade to Beckham and Vereen cost the Patriots down the field. Note the formation, with Vereen offset on Beckham and Tye’s side. Vereen and Beckham are essentially doubled down the field with intermediate coverage watching Vereen short and Beckham in the slant area with a FS over the top to keep Beckham from getting too deep. 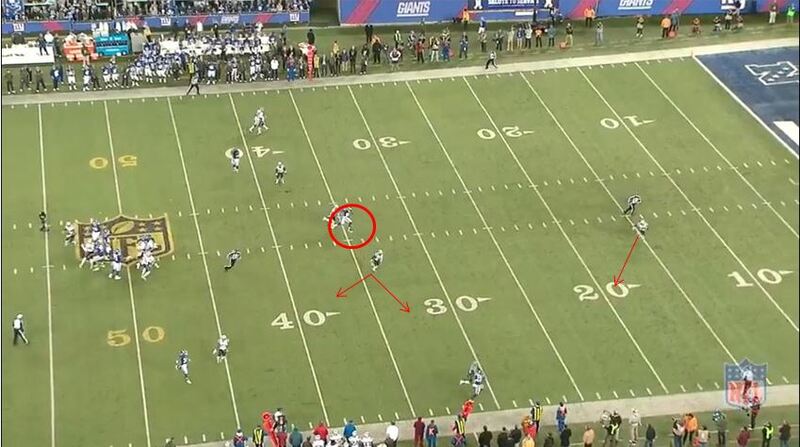 Note the keying from the FS and the split from the intermediate defender to react to either Vereen or Beckham. The result is TE Will Tye (circled) singled up in the seam. Flip the formation and again Vereen is watched by middle coverage, Harris is drawing LB attention and Beckham is again spied by the deep safety play side leaving Tye (circled in the middle) one on one. The three blue circles are all shading to cover two Giant players, leaving Tye to exploit the match-up. Just like the rest of this team, some good and some bad from this group. Playing without LG Justin Pugh and losing C Weston Richburg for a half, the group probably out-performed expectations. But the success running inside was completely thwarted by a well-prepared Patriots team. LG John Jerry and C Dallas Reynolds filled in capably, but there was an absence of any running game. LT Ereck Flowers gave up the second-biggest sack of the game with Giants driving in the 2nd quarter. DE Chandler Jones went low and outside, got perfect leverage on the 330lber and knocked the ball out of Manning’s hand to force a fumble, killing an excellent chance for points in the 2nd quarter. LG John Jerry did the job pass blocking, but the difference in quickness between his pulling and Pugh’s pulling may have been just enough to keep the Giants’ favorite running plays from working as planned. RT Marshall Newhouse gave up the sack to Ninkovich that killed a Giant drive that could have salted the game away or at least increased the 4th-quarter lead to 9 points at the least. Once again it seems the BBI review team has inspired another Giant to pick himself up by the Lederhosen, this time German import DT Markus Kuhn. Much maligned just about everywhere except 1925 Giants Drive in East Rutherford, the veteran DT came to play finally. Kuhn chipped in with 4 stops but it was his ability to finally hold up against double teams inside that spearheaded the defense to the tune of surrendering only 77 yards rushing on 23 carries. Kuhn’s Bavarian locks were flowing again on a fumble return caused by Brinkley’s sack and strip of Brady. Credit the return of JPP to the improved play inside. The constant double teams he faced allowed Kuhn and fellow DT Cullen Jenkins to see less traffic inside and hold the point-of-attack much better than they had in recent weeks. After coming out with a funky glove, JPP went back to the Martha Stewart oven mitt line and quickly swatted a Brady pass to make his kitchen ware work for him and forced an errant pass on the Patriots’ sickening game-winning drive. Overall a good effort by the DL, even putting enough pressure on Brady to force an errant throw that should have ended the game, and coming with 3 whole sacks in one game (though only 1 went to a DL). Jasper Brinkley did his best to will his defense to victory with 12 tackles and a sack, but it wasn’t enough to keep the best offense in the NFL from ultimately winning this battle. Brinkley was again powerful inside getting good penetration on several runs to keep huge HB LeGarrette Blount in check. And it was #53’s throw down of Julian Edelman that broke the WR’s foot and took a key playmaker off of the field for 3 quarters. Brinkley’s 4th-quarter sack and strip of Brady was all the veteran could do to hand his team the game but it was not to be. Devon Kennard again played well on the edge, ending a screen play Antonio Pierce style late in the first quarter and piling up 6 stops overall. Jonathan Casillas was active with 7 stops but was late covering on Brady’s 4th-down pass and game-saving completion by – you guessed it – just inches. He also took a terrible angle on the game’s final offensive snap allowing WR Danny Amendola the space to cut inside and make it into field goal territory. It’s tough to knock these guys considering the opponent and how well they played for 3 quarters, but Tom Brady exploded for 200 yards in the second half and ultimately won the game through the air. S Landon Collins’ rocky season continued as the rookie failed to seal the game with an interception-turned-drop on the Pats’ final drive. 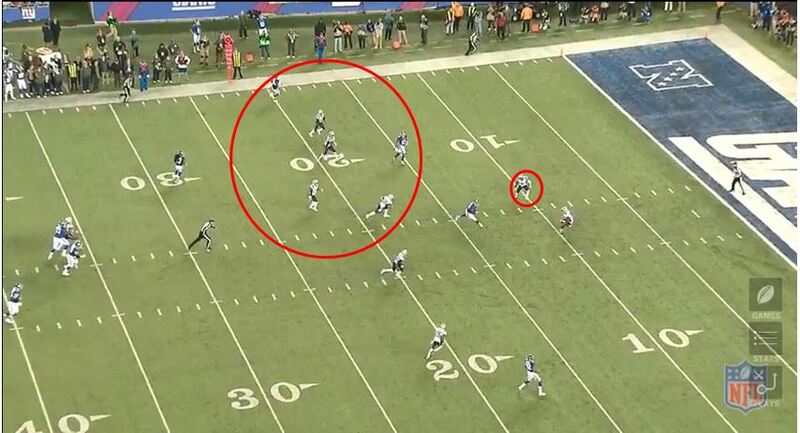 He also failed to play with inside leverage against TE Scott Chandler on the Pats’ first TD of the game. This group simply couldn’t get stops on 3rd and 4th down on the game’s alpha and omega drives and it cost them dearly. Credit S Craig Dahl with playing Gronkowski as well as he could for 3 quarters until the All Pro ultimately burned him for a 76-yard TD catch-and-run. Dahl was aggressive all day long, separating Chandler from the ball deep inside G-Men territory and hopping on Tom Brady for a sack that forced a Patriots FG. Dahl just missed on Gronkowski’s long TD which again put a bad ending on an otherwise strong game from the once and former Giant. Jayron Hosley filled in solidly at times, knocking away a 2nd-down Brady pass as the first half wound down and knifing inside to drag down Gronkowski to force a FG in the first. It was Hosley though who completely whiffed on a Brandon LaFell’s 54-yard catch that put the Pats in scoring range. 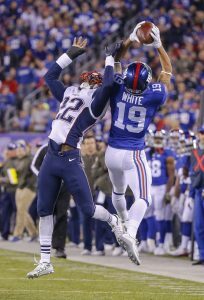 CB Trumaine McBride was flagged for a pass interference penalty in the end zone but redeemed himself on the Pats’ next foray, picking off Brady and preventing a potential 31-23 deficit that became a 26-24 Giant lead. Penalties on returns and Amendola’s 82-yard escape on a punt return brought the once-maligned group back to the fore of the “where did it go wrong?” discussion. Josh Brown was perfect again, hitting all four FGs and both XPs. P Brad Wing was in no way to blame for Amendola’s long punt return, it was a perfectly-placed sideline shot that Amendola simply made a great play on. Harris averaged a modest 19 yards on 2 kick returns and a solid 10-yard average on 4 punt returns. Kick coverage was again good, but that punt coverage, oy vey. Against the league’s best offense, the Giants played a strong 3 quarters but finally caved in in the 4th. Steve Spagnuolo’s charges kept Brady in check with a combination of man and zone coverages that focused on shutting down do-everything TE Rob Gronkwoski. Holding this offense to 4 punts and a respectable 27 points is an accomplishment that seemed impossible coming into this game but again it wasn’t quite enough when you rely on a rookie safety and two 10-year plus vets as your deep patrol. As much as it would be nice to give tons of credit to Spags and his defense for 3.5 quarters, the failure to stop another game-clinching drive undid all of the good will. The result wasn’t satisfying, but again the effort and fight was, as his 32-ranked defense gave the Patriots all they could handle for 3.5 quarters. Ben McAdoo’s offense was good, but not good enough. McAdoo’s gang notched 6 scoring drives, but only scored 2 TDs in a game decided by one point. McAdoo again kept to the running game despite its ineffectiveness and it provided Eli with enough balance to power to another 300-yard plus day. Inches here and inches there and we’re celebrating an improbable win, so I won’t kill any of the coordinators for this one. They both had their groups ready to play. In a game full of lead changes, big plays and ultimately a depressing ending, I just can’t give out the award to anyone on that field on Sunday. Love him or hate him, Tom Coughlin and his guys were ready despite the 4th-quarter head-scratchers again. It’s been covered relentlessly since it happened and it may have no place in a silly football redux, but I really want to cram this award in ISIS’ or ISIL’s faces and then down their collective throats for the horrific attacks in Paris last week. It’s not often that world events creep into the reviews but this was a doozy, and on a day that we were all a little deflated, keep in mind that we were peacefully watching a football game between millionaires that didn’t go our way. It sucked to be sure, but as I age and keep getting fatter (get in mah belly ISIS), I have a hard time cramming things like football when a band of misguided nitwits seek to murder innocents. So ISIS, ISIL, jerkfaces of the highest order, cram it in your suicide-vest-laden cramholes.